Murlene Mowery, of Millsap, Texas, a treasure trove of NCHA history, passed away January 21, following a brief illness. Mowery, 86, a long-time secretary of several NCHA affiliates, had been a go-to member of NCHA’s show department in recent years. 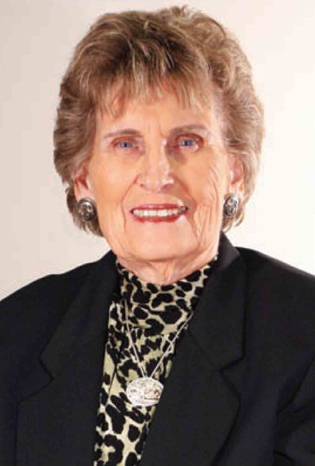 She was inducted into the NCHA Members Hall of Fame in 2009 for her years of contributions to the Association. A 1948 graduate of Henrietta (Texas) High School, she married cutting horse trainer Bill Mowery, and worked many years as office manager for a luxury hotel’s restaurant in Scottsdale, Arizona. She “moonlighted” as a show secretary. But she never had time to become a cutter herself. Arizona’s climate and cattle made it a magnet for out-of-state cutters while she worked the shows. “In the ’70s, ’80s and early ’90s, we had our Sun Circuit at the feedlot in Casa Grande,” she recalled. “We had plenty of cattle, so we had lots of entries. One year, our Sun Circuit was the biggest approved NCHA show in the United States. For more than 20 years, she served as show secretary of the Arizona CHA. She returned to Texas after her husband passed away. Her experience, knowledge and energy made her an invaluable addition to the NCHA staff. She enjoyed keeping in touch with people she knew from across the country. Mowery’s sons, Mike and Rick, are well known to NCHA members. Mike was 1983 World Champion on Handle Bar Doc and won the 1997 NCHA Futurity on Some Kinda Memories. He served as NCHA President in 2005. Rick won multiple aged events, and both Rick and Mike are AAAA judges. 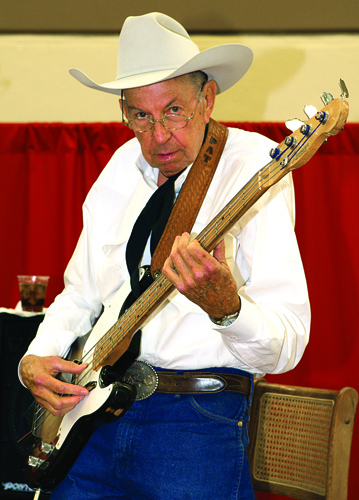 Long-time NCHA member Pat Jacobs, 79, passed away August 29. Jacobs was an NCHA Members Hall of Fame inductee, and he also received the NCHA Judges Distinguished Service Award. A popular musician and raconteur, Jacobs showed against the sport’s legends, and he judged cuttings for more than 40 years, including the first monitored show. He placed the longest running advertisement in the history of NCHA’s Cutting Horse Chatter magazine. As a teenager in Kansas, Jacobs earned walking around money by driving cattle to the rail yards and helping load them onto stock cars. He saw Buster Welch ride Marion’s Girl at a county fair, and immediately forgot about his aspirations to be a roper. He got a job working for a trainer and picked up the trade mostly “through osmosis.” By the early 1960s, he was judging shows. As a showman and as a judge, Jacobs was always looking for ways to improve the sport. After a weekend show, he and his fellow cutters would brainstorm, and more often than not Jacobs was the one chosen to deliver their ideas to NCHA headquarters. Jacobs once recalled a time when cattle suppliers would make sure only their best stock would be used at the shows. Jacobs’ adventures were featured in Tom McGuane’s collections of essays, Some Horses , and in his own book, Outcasts, Outlaws, and Second Chance Horses: The Pat Jacobs Story . A viewing will be held at St. Joseph Catholic Church in Ashland Ks at 7:00pm on Friday Sept 2, 2016. The funeral will take place at 10:00 am Saturday, Sept. 3. A celebration of life will be held in this area at a later date. 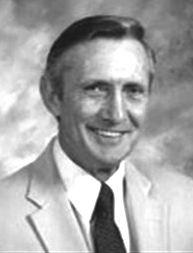 Milo Sullivan of Perrin, Texas, former Secretary-Treasurer of the National Cutting Horse Association passed away May 19 at the age of 84. 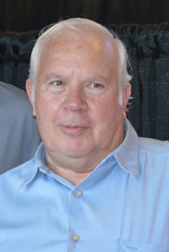 Sullivan grew up in east Texas and began working in advertising sales for the Dallas Morning News and later worked for Quarter Horse Journal in Amarillo. He became Secretary-Treasurer of the National Cutting Horse Association in the late 1950s and was editor and publisher of The Cuttin’ Hoss Chatter. He left that position in 1960 to join Wayne Cook Associates auctioneers. Sullivan was succeeded at the NCHA helm by Zack Wood, who held the position for three decades. Sullivan later worked in the oil field industry and as a real estate broker. He worked for Bob Tomes Ford from 1983 until 1998. He was also a regular columnist for Lone Star Horse Report for many years. He is survived by his daughters, Debbie Cheatham of Arlington, Texas and Lynette Williams of Perrin, Texas; and many grandchildren and great grandchildren. He was preceded in death by his beloved wife of sixty-three years, Estelena, and by two brothers and four sisters. A memorial service will be held at 10:00 a.m., Tuesday, May 24, 2016, at Turrentine-Jackson-Morrow Chapel in Allen, Texas. Jack Newton on 1959 World Champion Poco Stampede. 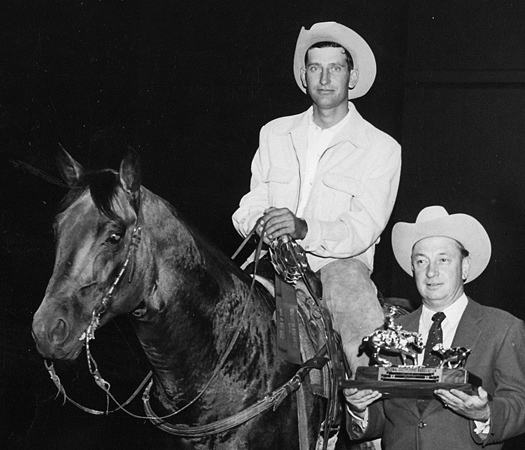 NCHA Hall of Fame Rider Jack Newton, 90, of Keller, Texas, passed away Sunday. Newton was a World Champion cutting horse rider, a long-serving NCHA judge, a mentor to a new generation of trainers and a top roper. He adapted an idea from the bird dog world, lobbied against strong resistance and finally helped launch what is today cutting’s signature event, the NCHA Futurity. Newton grew up on a cotton farm near Abilene, Texas, but at 15 went to work for his uncle, Guy Weeks, who sold Thoroughbreds as polo ponies and to the U.S. Army, and kept 5,000 mother cows. Newton met George Glascock, NCHA’s first World Champion, who would buy cattle from Weeks. And Glascock mentored him as Newton took a mare named Guthrie Ann to the 1951 Fort Worth Stock Show. While he was showing Guthrie Ann for oilman G.F. Rhodes, Newton broke tradition and held onto the saddle horn and lowered his rein hand. But other riders began to follow suit, and now you’d be hard-pressed to find a cutter riding in the old style. In the late 1950s, Newton showed Poco Stampede, who would become the 1959 NCHA World Champion. At a big show in Odessa, Texas, he won the AQHA cutting, the open cutting and was grand champion at halter. As a member of the NCHA executive committee in the early 1960s, Newton pushed for a new event for 3-year-old horses, the NCHA Futurity. Newton found an ally in Buster Welch, who would go on to win the NCHA Futurity a record five times. “We had to go out and get people to donate money for the purse at the first Futurity,” Newton said. “NCHA wouldn’t help us. But when the first one was over, they let us have money for the next one. Newton showed Commander King for James Kemp, and he bred and trained a Commander King son named Dun Commander that won 20 all-around titles with points in halter, reining, roping, western pleasure and cutting. 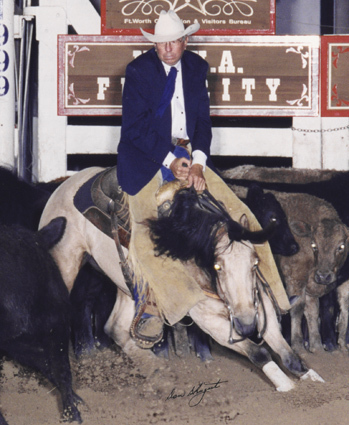 He was also the first rider to put two horses, Poco Stampede and Swen Miss 16, into the NCHA Hall of Fame. Newton was inducted into the NCHA Riders Hall of Fame in 1989. There will be a memorial service for Jack Newton on Sunday, May 1 at 2:00pm at Clay Johns Cutting Horse Arena, 151 Johns Lane, Millsap, Texas 76066. Parker County in North Central Texas is named for her Uncle Isaac. Yet had it not been for her son, Comanche warrior Quanah Parker, Cynthia Ann Parker’s name might have been lost to history, along with countless other victims of brutality on the Western frontier. When Quanah Parker appeared as part of the posse in the 1908 silent short The Bank Robbery, it was a pivotal moment for the fledgling movie industry and the beginning of America’s love affair with the bygone Western frontier. 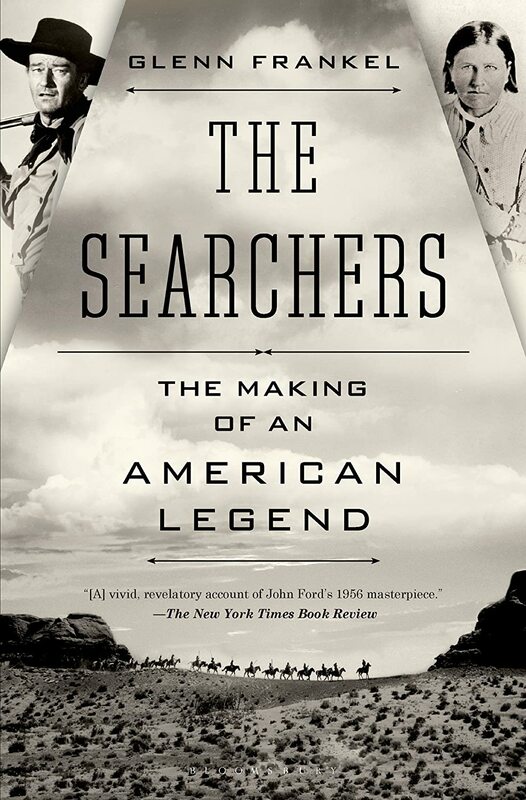 In his recently released book “The Searchers: The Making of an American Legend,” Pulitzer Prize-winning journalist Glenn Frankel connects the saga of Quanah Parker with the making one of Hollywood’s most iconic movies. Directed by John Ford, starring John Wayne, and released by Warner Bros. in 1956, The Searchers was based on Alan LeMay’s novel of the same title, inspired by the story of Quanah Parker’s mother, Cynthia Ann. In 1836, nine-year-old Cynthia Ann Parker and four family members were abducted during a Comanche raid on their isolated pioneer stockade, in the newly created Republic of Texas. Five others, including Cynthia Ann’s father, uncle and grandfather were savagely killed and dismembered. Twenty-four years later, having assimilated Comanche culture and mothered three children by tribal chief Peta Nocona. Cynthia Ann was discovered by Texas Rangers, following the Battle of Pease River, and released to her uncle, Isaac Parker. Terrified by her white “captors,” Cynthia Ann more than once attempted escape with her infant daughter Prairie Flower, before resigning herself to her fate. Despite well-meaning efforts by a succession of Parker family members who took her in, Cynthia Ann pined for her Indian family until her death in 1871. “She was virtually a prisoner among her own loving kindred, but they did not realize it until it was too late,” said Isaac Parker. The transition to the white man’s world was much easier for Cynthia Ann’s son, who had evaded capture until 1875. Practical, as well as savvy, Quanah Parker helped enforce reservation laws and negotiate peace with the few remaining renegade bands that remained on the High Plains. He also made friends and eventually became business partners with influential ranchers such as S.B. “Burk” Burnett, E.C. Sugg, and Dan Waggoner, and even won over Theodore Roosevelt, who invited him to participate in his 1904 inaugural parade. Jack Waggoner was just a toddler, when he accidentally locked himself inside the tack room of the horse barn on the farm of his grandfather, Edward A. Deeds, near Dayton Ohio. Waggoner thinks the incident might have triggered the asthma attacks he suffered whenever he was near horses. Fortunately for the Western performance world, Waggoner outgrew his allergy to horses and developed a program with a 1988 colt by High Brow Hickory that made Waggoner the all-time leading breeder of cutting horses and High Brow Cat the all-time leading sire of cutting horses. In 1945, when Waggoner was three, Edward Deeds’ barn was famous not because of horses, but because of horse power. It was there, in 1908, that Deeds’ partner and co-worker Charles Kettering began work on an ignition system that would revolutionize the auto industry. After Cadillac ordered 8,000 of the new ignition sets, Deeds and Kettering founded Dayton Engineering Laboratories Company (DELCO), and developed the first reliable automobile self-starter, in 1911. At the start of World War I, DELCO expanded to include the Dayton-Wright Company, with Orville Wright and H.E. Talbott. Dayton-Wright manufactured the DeHavilland DH-4, the only American-built bomber to see action in World War I, and the plane in which Orville Wright, who made the first ever manned, powered flight, in 1903, made his last flight, in 1918. “When they sold Delco to General Motors, they drew straws to see who would stay and run the power (company) for Dayton and who would go to General Motors,” said Waggoner. “My grandfather won and he stayed in Dayton and we all heard of Charlie Kettering because he lost.” Kettering became vice president of General Motors Research Corporation in 1920, a position he held for 27 years. Born in 1874, in Granville, Ohio, Deeds worked his way through nearby Denison Univsersity and upon graduation, studied the relatively new science of electrical engineering at Cornell, one of the first universities to offer a degree in the field. Deeds returned to NCR in 1902, as a vice president and assistant general manager, and hired young Charles Kettering, an electrical engineer from Ohio State University, to work on his idea for an electric cash register. It proved to be an inspired and enduring relationship, with Deeds as the “idea man” and business mind and Kettering as the inventor and technical genius. Deeds retired from NCR in 1914. 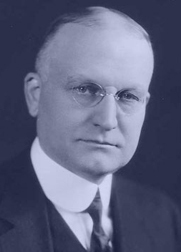 At the time he returned as the company’s president, in 1931, he was serving on the boards of 28 corporations, from the General Sugar Company to one of the most powerful banks in the world. He served as president of NCR until 1940, then as honorary chairman, until his retirement in 1957. Moraine Farm, Edward and Edith’s sprawling home and site of the famous Deeds barn, was the first private home in the United States to have an airstrip, and the Deeds’ yacht, “The Lotosland,” was the first private boat in the world to carry an amphibious airplane. Edward Deeds died at Moraine Farm in 1960 and is buried at Woodland Cemetery in Dayton, also the final resting place of Orville and Wilbur Wright, Charles Kettering, and NCR founder John H. Patterson. For or against, rich or poor, public welfare has benefited all Americans. 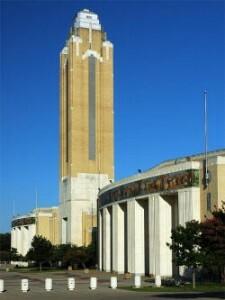 Will Rogers Memorial Coliseum in Fort Worth, Texas, where cutting horses and riders are currently headed to compete in the 2012 NCHA Futurity, is a good example. The iconic landmark, as well as economic boon to the City of Fort Worth, could not have been built without federal funds from the Public Works Administration, later known as the WPA. “The business of the America people is business,” said President Calvin Coolidge during the Roaring Twenties, a time of rapid economic growth, scant federal oversight, and rampant speculation, as brokers lent small investors two-thirds of the face value of their stock purchases. The historic stock market crash of October 29, 1929 definitively marked the end of the prosperous twenties and the beginning of a dire economic depression. By 1933, one year after progressive Democrat candidate Franklin Roosevelt soundly defeated incumbent Republican Herbert Hoover, Fort Worth, a bastion of self-reliant conservatives, made its first application for federal funds, which it would continue to rely upon until the beginning of World War II. Will Rogers Memorial Complex, consisting of the coliseum, as well as an adjoining 208-foot tower and an auditorium, was a beneficiary of these funds, which were supplemented by the City, local leaders, and the US Centennial Commission. It was Texan John Nance Garner, Roosevelt’s vice president, who was instrumental in getting a substantial appropriation from the Centennial Commission. But it was Fort Worth newspaper publisher and civic leader Amon Carter who appealed to his friend, Franklin Roosevelt, for federal funding to construct the coliseum and auditorium to be completed in time for the 1936 celebration of the Texas Centennial. Although Dallas had been selected as the official site of the Centennial, Carter and civic leaders convinced officials that Fort Worth should be designated as the “Livestock Division” of the celebration, which they dubbed the Frontier Centennial. The domed coliseum, designed by Herbert M. Hinckley Sr., was revolutionary for its time, offering an unobstructed interior view thanks to its unique use of arched steel trusses in the roof. The magnificent 200 x 10-foot tile friezes, running across the upper outside facade of the buildings and depicting people and scenes from Texas history, were designed by Herman Koppe, who was also responsible for other decorative elements reflective of WPA-era architecture, including Art Deco and Moderne style fixtures and motifs. Coliseum and auditorium construction had barely begun in 1935, when Will Rogers, beloved American humorist, movie star, social commentator, syndicated columnist, and friend to Amon Carter, was killed in a plane crash. Of Cherokee heritage, Rogers was born in Oklahoma and worked his way from cowboy to circus performer to vaudeville and beyond. Yet he never forgot his cowboy roots. When Carter proposed that Fort Worth’s new entertainment complex be named in honor of Rogers, there were some dissenters, but Carter won out.